FIVE APPEARANCES. Four innings pitched. One hit. No runs. 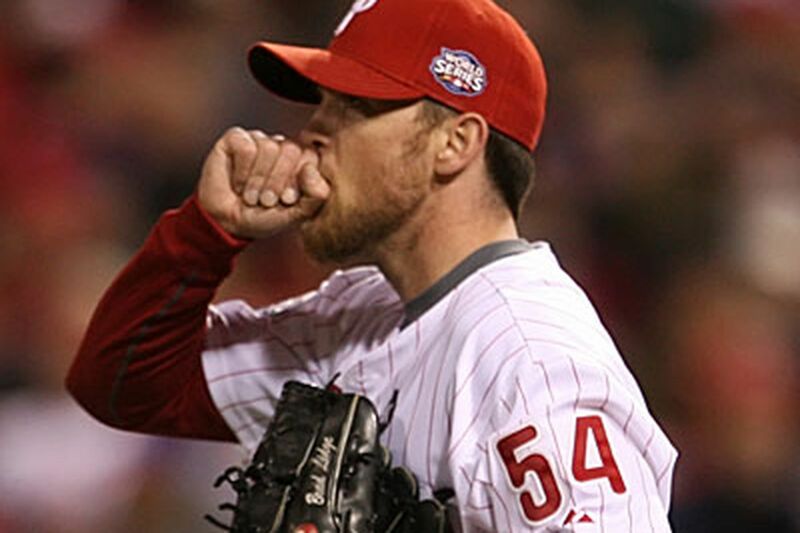 That had been the postseason enjoyed by Brad Lidge before last night. Then, it happened. This is what we have all expected to happen since about June. This was the concern. The emotions have risen and fallen since that time, and the opinions and prognostications have varied along with those rhythms. But the thing has always been there, in the back of everybody's mind. The thing: that Brad Lidge really wasn't Brad Lidge anymore. Perfection is the standard. Lidge set it. Lidge knows it. That he never had a chance to match it, after his impeccable, impossible 2008 season, was a known fact. But he has not approached it. He has not been in the area code. We have all pretended sometimes, or kind of pretended. But we always really knew, deep down. And then the ninth inning happened, offering crushing confirmation that it really isn't 2008 anymore. And now, after a 7-4 loss to the Yankees, the Phillies trail in the World Series by three games to one. The hope in his eyes screamed at you as Lidge spoke to a mob of reporters in the Phillies' clubhouse. It will be hard to forget the look in those eyes. The ninth inning, it began with such promise. When Pedro Feliz hit the game-tying home run with two outs and a 3-2 count on him in the bottom of the eighth inning, it energized Citizens Bank Park. It offered hope most of all, loud hope. And it was on that wave of noise and emotion that Lidge rode out from the bullpen. Pinch-hitter Hideki Matsui led off the inning and popped out to shortstop. Derek Jeter, who already had scored a run and driven in a run, struck out. There were two outs and Lidge was looking just fine. And you sat there and wondered. Phillies manager Charlie Manuel had watched the deconstruction of Lidge this season and never gave up on him. Manuel had worked to rebuild Lidge, to resurrect his confidence. It has been great work, and Lidge had shown signs, flashes, whatever. The postseason had been untainted. But, deep down, well, who knew? With two outs, Lidge could not put away Johnny Damon, who fouled off pitch after pitch before serving a single into leftfield. It was a nine-pitch at-bat and it changed everything. So Damon stole second, which has become pretty standard operating procedure. The sickening, unforgettable moment came next. Because they had an overshift on against Mark Teixeira, Feliz was the one who took the throw down to second base. That means somebody else had to cover third. So, who should be covering? From there, Lidge completely unraveled. It was as if the strange Damon moment unnerved him, costing him his focus - although Lidge denied this afterward. He hit Teixeira with a pitch, bringing up Alex Rodriguez. A-Rod drilled a two-run double to leftfield, scoring Damon, and then Jorge Posada followed with a two-run single that made it 7-4. Rodriguez hit a fastball. Lidge was asked if he threw fastballs early to A-Rod because of a hesitancy about bouncing a slider with Damon on third. Lidge said that wasn't it. He said he's sure they would have gotten to the slider eventually. It is a question for the ages. Anyway, at that point, the deconstruction was complete. And the question for Manuel was if the Damon moment cost Lidge his focus. And then he wasn't. And now the Phillies need Cliff Lee to save them, which used to be Brad Lidge's job.